It was barely six in the morning. The sun had just begun to peek over the desert mountaintops to the east when the now-familiar melodious call to prayer crept in from the cracked window above my bed. Keaton sat up, turned and put his feet on the tile floor. His cot squeaked as he shifted his weight forward to stand. “Get up. We’re gonna be late,” he grunted at me, grabbing for whatever piece of clothing he could find and tossed it at my head. “We’ll miss the tide coming in,” he said as he threw on his board shorts and left the room. I followed suit and met Keaton and rest of the group upstairs for a light pre-surf breakfast. We were in Taghazout, Morocco, just North of Agadir on Morocco’s formidable Atlantic coast. It was a chance to take a week off from our research in Western Europe for a company we were in the process of starting. We had quite the motley travel crew. First, Keaton and I, two Texan travelers, eager recent graduates who loved to take on surf that was way out of our league and make fools of ourselves in the process. There was also Daniel, a former accountant from São Paulo, Brazil who had quit his job, moved to the beach and started a hostel. Scottee is an Aussie who used to work on oil rigs but had recently also quit his job, sold all of his possessions, and embarked on an endless trek around the world. And finally, we had Rasheed, our local guide who sported a long beard and thought very little of us as surfers but didn’t seem to mind us as people. With our boards piled high on the roof of our 4×4, we climbed in slowly, not yet energized from our morning coffee. We headed South to Anza, a small town and beach break that was popular with the local surfers and somehow managed to have a decent wave even without a significant amount of swell. As we unloaded the boards, I looked around and took a few pictures. The scene was typical of any beach: kids blissfully chasing each other, playing soccer with makeshift goals in the sand and parents nervously watching as their children entered the water. Every once in a while we would see a full Burka sub into the soccer match or emerge from the water to remind us that we were in fact in Morocco. We surfed the majority of the morning in decent conditions and then retired to the tiny café just off the beach for a mint tea. We joined Rasheed at his table and placed our orders. Rasheed chose not to surf this day. He had been spoiled by a winter full of swell and barreling rights. The summer swells rarely peaked Rasheed’s interest. Over tea, we decided to forgo surfing for the rest of the day and head into the Atlas Mountains to take a dip in a popular swimming hole. Before heading inland, we drove South through Agadir. Agadir is nuzzled into Morocco’s South Atlantic Coast and is an absolute cultural anomaly. 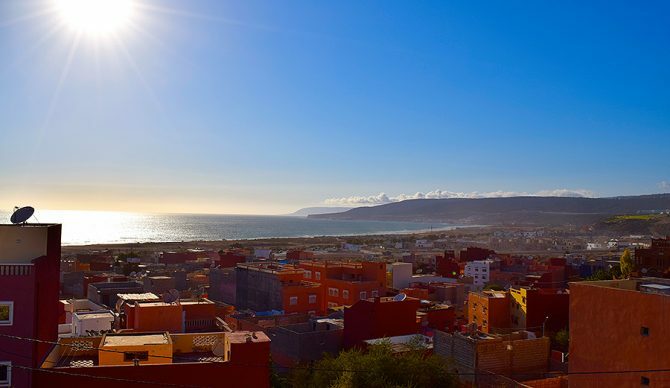 While Agadir does boast a healthy tourist economy, it was no Casa Blanca; most of the tourists in Agadir came from other Moroccan cities. Looking out the window as we drove by the surprisingly gentrified coastline, I was reminded more of Santa Monica than I was the Morocco I had learned about in a university seminar room. As we made our way further inland, the landscape changed drastically. The once breezy coastline road had now transformed into a narrow mountain pass. Our 4×4 clambered its way high up into the Atlas Mountains, and from the window of the car, I spotted an isolated green area tucked away between two sloping hillsides. It was a tiny desert oasis hiding from the world behind the gargantuan slopes of the Atlas Mountains, and it was our final destination. We began driving parallel to a small river. About every mile we would pass a small mountainside cafe that extended into the river, each with a customer or two enjoying their tea or coffee in partly submerged chairs and tables. We finally pulled up to the trailhead that would take us to our personal oasis. I stepped out of the car to stretch my road weary legs. I gazed up at the surprisingly steep trail ahead and then down to my feet. I realized that I had made a fairly large error in my choice of footwear. Flip flops probably weren’t the wisest choice for what turned out to be an hour and a half of steep muddy trails, loose rocks, and narrow cliff tops. Our somewhat turbulent hike eventually led us near the river we had seen on the drive up. We trekked along a narrow path in the jagged mountain that was carved by the slow flow of water. As we walked, we encountered pool after pool. Each seemed perfect for swimming, but we kept moving forward. Finally, we came to a large pool that was surrounded by tall cliffs. This was our oasis. We hurriedly tucked our things away in the mountainside and plunged ourselves into the brisk water, leaping from the cliff tops one at a time. After about half an hour, a group of young boys appeared with a massive bag. They took a seat by the water’s edge and proceeded to take out a small propane tank and a large silver teapot with a matching tea set. I thought this was a bit odd, but Rasheed said it was common. The boys made and drank their tea before joining us on the highest cliff to attempt to backflip into the water. After another hour of narrowly escaping spinal injuries and relaxing in the water, we packed up to make our way back down the trail. Before I could answer, I felt a swift tug under my arm, as I was unexpectedly lifted to my feet. It was the old man from the fruit stand. He had seen the whole thing and rushed over to help me before I had even finished falling. Without saying a word, and before I could thank him, the old man placed my arm on top of his shoulders and began walking me up the hill. We climbed back onto the ledge and came to my shoes that were sitting neatly together as if someone had placed them there. The old man looked at the shoes and then to me. He started to speak Arabic, but then saw from my face that I couldn’t understand him. He then started to speak French, but the confused expression didn’t leave my face. Finally, he picked up my shoes and pressed them against my chest until I grabbed them. He then took off his own shoes and placed them in front of my feet. This man was at least sixty-five years old, if not older, and he had the same hike back to the road that we did. Yet here he was, offering me the shoes off of his very feet. I was stunned. Never in my brief 22 years of existence had I seen kindness of this magnitude. I had Rasheed tell the old man that I was grateful for his help. I thanked him kindly for his offer, but I could not accept. I silently hobbled on through the rest of the hike back, completely amazed by the kindness of that old man. Here I was, five thousand miles away from home, treated as if I was his own son. That single moment completely reaffirmed my purpose for embarking on this long journey. Keaton and I were across the Atlantic piecing together a new a trip for our student travel company, Knowledge on the Run. And here we learned exactly what one can gain through travel: an overwhelming assurance that the world is full of kindness and people who are eager and willing to help out their fellow man. This is what our students need to experience for themselves. I left Morocco just a few days later and returned to Texas from Paris a mere two months later. But the actions of that one old man in Morocco have stayed with me, still serving as motivation for what I do every single day.